It’s almost mid-month. I’m at about 19,000 words, about 3,000 words behind my carefully calculated NaNoWriMo goal. (I’ve made an excel spreadsheet). I took my blood pressure yesterday and realized that stressing about keeping up with my self-imposed word count is not helping anything. In fact, my scientific approach to this endeavor – just 2,000 words a day, gives me 5 days off – is totally ludicrous. Creativity doesn’t work like that. I should know better. Just as I walked up to the metro on Saturday, the doors shut in my face. I was literally one second too late. Damn. Steamed. I’d been working in the Starbuck’s on the Place St. Francois for the last couple of hours. Yes, I know, Starbuck’s is a big, evil chain store that sells sub-par coffee for over-par prices and manipulates people with all kinds of marketing gimmicks. But it’s the only coffee shop I know of around here where I can get out of my head and into my writing properly. If I stay at home on the weekend I’m constantly being asked for food by the resident teenagers or feeling like I ought to be doing laundry, and I can’t get anything done. See, in a place like Starbuck’s there are a lot of distractions. Babies crying, background music, other people working and talking, low lighting, lots of people coming and going. So many distractions, in fact, that I have no choice but to tune them all out and concentrate fully on the task at hand. And Starbuck’s, evil as it may be, does have one thing figured out: how to leave you alone and not make you feel guilty for taking up space. It’s like the Apple store I went to in Albuquerque, where the Japanese guy was just working away at one of the demo computers and nobody minded. I appreciate that. Plus I secretly want to be J. K. Rowling. I’ve always liked writing in the midst of chaos. In college, I wrote all my essays parked in a coffee shop near campus, drinking foamy lattes and eating chocolate chip cookies. Back then, in the dark ages, that meant writing by hand on a pad of paper, like in the picture at the top of the post. Now, with a laptop, it’s so much more efficient! As long as there’s a plug and tons of distractions, I can go into my zone. When I found out J. K. Rowling wrote Harry Potter in a coffee shop, it clicked. Someday I, too, would write a blockbuster in a coffee shop. So there you have it, people. It’s finally happening. Anyway, back to the metro. The monitor said the next one wouldn’t be there for 12 minutes, so I went into the news shop in the metro station and browsed the magazines. I took down the Economist, put it back. I can’t read it, it’s too dense and I object philosophically to the absence of bylines. Wired was really tempting. Then I caught a glimpse of the Technology Review hiding on a shelf behind. I pulled it out and looked at the cover. There on the cover of the Technology Review was a blurb that said Stem cells get personal. I may have mentioned that the novel I’m writing involves stem cells. I’d just had a bit of a block on the subject back in Starbuck’s, and I needed to do some research. I opened the article, and it was perfect. Exactly what I was looking for. How’s that for divine intervention? I was so psyched that I went out for a run when I got home. I realize I have been remiss in reporting on my barefoot running adventure, so here’s an update for those of you who are interested: I haven’t put on a pair of regular running shoes since August. No kidding. I only wear my New Balances Minimus Trail shoes now. In fact, I wear them almost every time I leave the house for anything, I like them so much. On Saturday, I don’t know whether it was the elation of having found the article on stem cells and unplugging the block in my writing, or the fact that there was a cushion of soft-looking fallen leaves on the ground, but I had a sudden urge to make skin-to-earth contact, and not with my face like I did last week, but with my feet. I took my shoes off and ran about 2 miles barefoot. The leaves took the worst of the bite out of the nasty little evil stones on the path. I ran along the beachfront in Preverenges, in and out of the water, feeling like a little kid. Then when I got back to the really evil section of path I photographed on my earlier post, I sat down by the lake and put the New Balances back on. What a great run! A lot of people had given me strange looks, but I just smiled and carried on. My feet felt so happy. I know you want to try barefoot running, too. In another astonishing stroke of serendipity, I ran across a how-to video this weekend so you can get started in the comfort of your own living room! In honor of the New York City Marathon, Christopher McDougall, of Born to Run fame, has an article in the NYT Magazine this Sunday. There’s a video of him hopping from one foot to the other, demonstrating how to work on your running form. If you don’t have a subscription to the online NYT, you can see the video at this blog, Hunter-Gatherer (written by a NYC barefoot runner type). 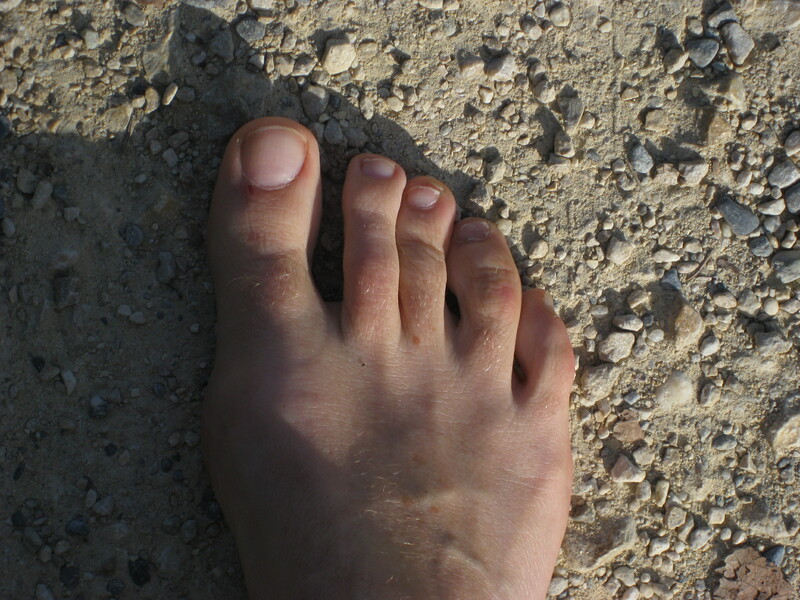 Running barefoot may seem crazy, but trust me, it’s going mainstream. In a few years you’ll be thanking me for getting you started, because you will be so far ahead of all the other sad losers out there. Images: top, StarbuckGuy. The other one is my foot.